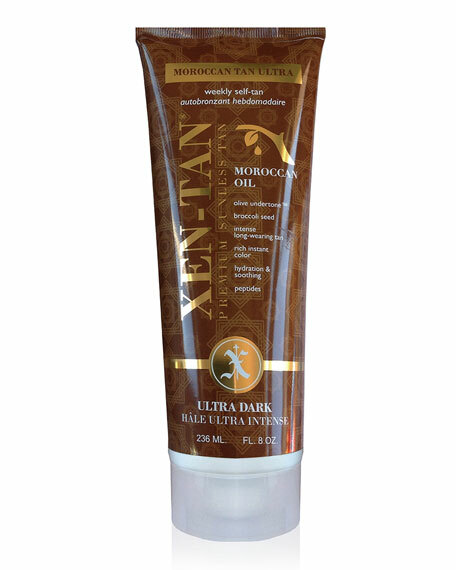 Xen-Tan Moroccan Tan Ultra Weekly Self Tan, Ultra Dark, 8 oz. Xen-TanMoroccan Tan Ultra Weekly Self Tan, Ultra Dark, 8 oz. Moroccan Tan Ultra is the ultimate experience in self-tanning! With a new break-through in DHA (the self-tanning ingredient), Moroccan Tan Ultra gives you a dark tan that stays dark for a full five days. After the five days, your tan naturally starts to fade without any spotting. This new product has a delicious tropical scent with no processing odor. The luxurious ingredients make this the premium tanning experience; it contains peptides to build collagen, Moroccan Oil for smoothing, and humectants to give you ultra-even tanning. This product has a time-release ingredient that gives a true brown color so you never have to fear orange tones. With a realistic instant color, get ready to look thinner and more toned with Moroccan Tan. For in-store inquiries, use sku #1530354.